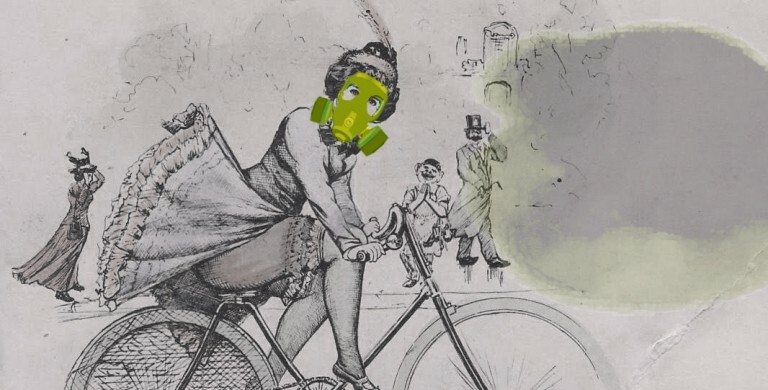 Six ways to reduce the impacts of air pollution on people riding bicycles. People riding bicycles in lanes directly adjacent to vehicles are exposed to higher levels of traffic-related air pollution than those riding on separated lanes or paths. Yet pollution exposure does not directly influence how we plan and design bicycle facilities. As we wrap up National Bike Month, here are six ways that we can make it easier to breathe on a bicycle. I live in DC, about 10 miles from Rhodeside & Harwell’s Northern Virginia office. I often commute by bicycle, on a scenic route that takes me along the Potomac River and past the monuments on the National Mall. While I enjoy greeting Mr. Jefferson on my way to work, the Mall can also be a stressful place to ride, especially during DC’s long tourist season (i.e., most of the year). There is a great two-way, on-street bike lane on 15th Street that ends at Pennsylvania Avenue. Many cyclists try to switch over to the sidewalk at that point, since it is officially a shared-use (bicycle/pedestrian) path. However, parts of the path get quite narrow, and there are also no signs that indicate that all are welcome to use the sidewalk. This is problematic (1) because many tourists aren’t used to interacting with people on bicycles, and (2) because the Mall is adjacent to the central business district, where it is illegal to ride a bicycle on the sidewalk. People have been suggesting ways to improve this important bicycle connection between DC and Virginia for years. For now, I switch to the general travel lane to make my way between the end of the 15th Street lanes and the bridge over the Potomac. I end up riding behind and between lots of cars, as well as large tour buses, trucks, and (occasionally) other people on bicycles. A few months ago, while riding in this stretch, I saw a person on a bicycle wearing a facemask. It struck me as odd, because it was a warm day. About 30 seconds later, I was passed by a dump truck that was loud and was kicking up a lot of gravel. Even more unpleasant was the grey trail of exhaust it left in its wake. Once I realized that I couldn’t take a deep breath without coughing, I understood why a facemask might be useful. 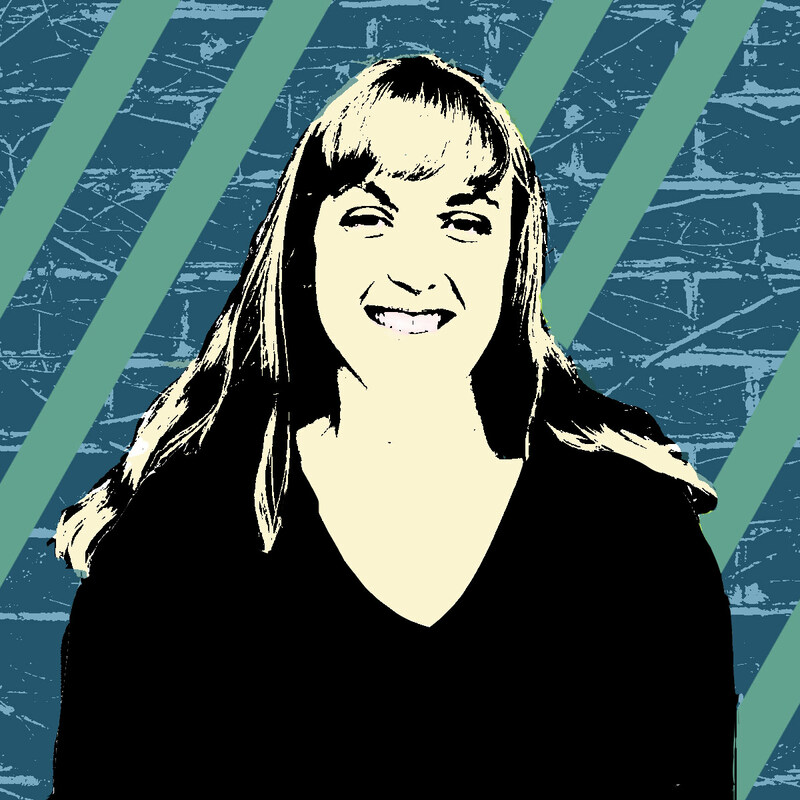 I don’t think anyone’s intentionally trying to “Coal Roll” me, but the amount of times that I’ve found myself riding in a cloud of exhaust – on my commute and otherwise – made me curious about the implications for my health. We know that vehicle emissions are doing damage. While both gasoline and diesel vehicles emissions are composed of gases and particulate matter, diesel vehicles (like many of the trucks and buses with which I’m sharing a lane) tend to emit more particulate matter. There are regulations to reduce the emissions from both gasoline and diesel vehicles, but many heavy-duty vehicles have long lifespans, which means that people are still driving older vehicles with older engines that aren’t subject to new regulations. These regulations are also generally aimed at reducing greenhouse gases and improving ambient air quality; they are not necessarily meant to protect us from the relatively immediate exposure that comes from riding a bicycle in mixed traffic. Fine and ultra-fine particulates (those that are less than 2.5 or 0.1 microns, respectively) are particularly adept at traveling deep into our lungs and causing problems. The effects of exposure to particulate matter (including lung function and respiratory changes, headache, fatigue, nausea, and coughing) can affect anyone, but are likely to be worse for certain groups of people, such as people with asthma and the elderly. Even for people in great health, pollution from traffic can decrease heart rate variability for up to three hours after exposure, causing the heart to behave “more like a minivan than a Ferrari,” in that the heart is slower to speed up or slow down in response to stress. (The irony of using a car analogy here is not lost on me.) This decreased variability is associated with a higher risk of heart attacks. Drivers are more exposed to airborne pollution than cyclists by a factor of 1.7-3.7, but elevated levels of particulates are of particular concern to people on bicycles because of their increased respiration and absorption rates compared with most other road users. Exposure is an important factor for calculating risk, but intake dose (the amount that is actually breathed in), uptake dose (which is affected by bicyclists’ higher respiration rates), pollutant toxicity, and existing susceptibility of the traveler must be taken into account. Before diving into how we can address exposure to pollution, it is crucial to note that the health benefits of riding a bicycle outweigh the risks. The increased activity for those who shift from driving a car to riding a bicycle for their commute results in 3-14 months gained while the potential mortality effect of increased inhaled air pollution results in 0.8-40 days of life lost. It’s intuitive that being active is good for our physical health, but it’s good for our mental health, too. Just because we know there are risks associated with riding a bicycle doesn’t mean that we should stop planning for (or riding) bicycles. Air quality and bicycles are already being tied together in many places, as cities recognize that the more that we exchange short automobile trips (which make up the bulk of urban trips) with non-motorized trips, the better our urban air quality and health would be. Now we just have to recognize that the relationship and impacts between bicycles and air quality go both ways. To start thinking about ways that different types of bicycle facilities and actions can provide benefits, I pulled together a (non-comprehensive and in no particular order) list of six ways that we can make it easier to breathe on a bicycle, from both the perspective of the planner and the bicyclist. Separated bicycle lanes are those that are – surprise! – separated from vehicle traffic by a painted buffer, plastic bollards (like the 15th Street lanes), a curb, etc. They can be more complicated to plan than typical vehicle-adjacent on-street bike lanes, due to intersection and space requirements. However, there are ways to mitigate the complications, and there are several existing guides that include specifications for separated lanes. 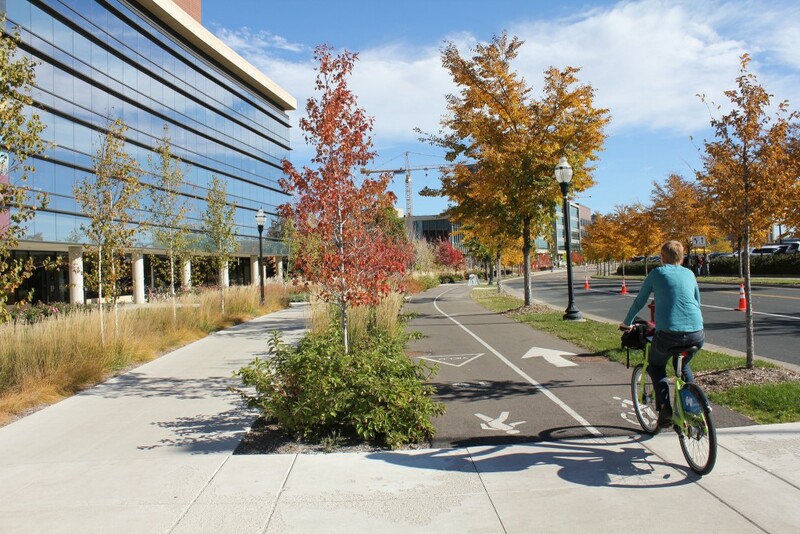 FHWA recently released their Separated Bike Lane Planning and Design Guide, and the NACTO Urban Bikeway Design Guide is also a great resource. 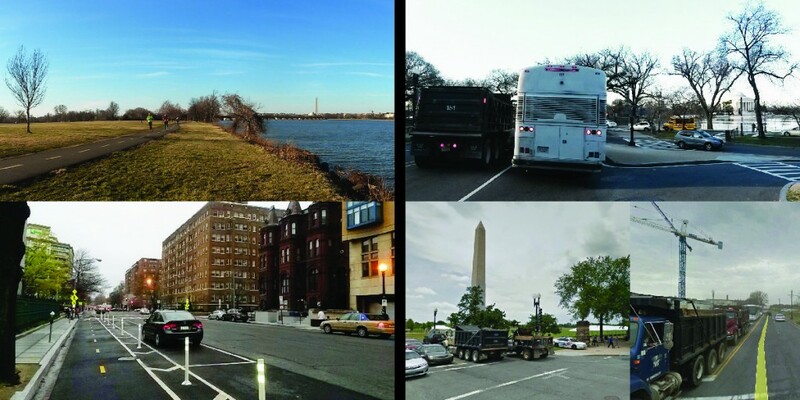 Protected intersection designs, which are popular overseas but are now being installed in the U.S., are one approach to intersection-specific complications. Though I’m using the FHWA terminology for these lanes, they’ve been called many different names. “Protected lane” is often used, though the actual level of physical protection depends on the type of barrier. However, research shows that bicyclists in separated lanes are exposed to less particulate matter, demonstrating that no matter what you call them, they may provide more protection for bicyclists than meets the eye. In one study, a bike lane separated from vehicular traffic by a parking lane resulted in up to 38% reductions in cyclists’ ultra-fine particle exposure relative to a traditional bicycle lane adjacent to the vehicular traffic lanes (likely due to the increased horizontal distance from traffic and the airflow over the parked vehicles, which cause the particles to clump together to form larger, heavier particles that do not as easily remain airborne). Another study found that non-separated bike lanes had concentrations of black carbon (a type of particulate) and NO2 that were about 33% higher than bike paths that are separated from traffic. Variations in exposure appeared to be influenced by distance from the road, vegetation barriers, and reduced intersection density. If cities find it difficult to install full systems of separated lanes, selectively prioritizing certain stretches (e.g., those where bicyclists’ respiration may be highest, such as steep grades) for separation upgrades or reducing required stops where pollutant concentrations are known to be high may provide a large exposure mitigation benefit. Cities can also try pilot programs that allow for changes and flexibility as the design is assessed. Even if a separated lane isn’t workable, it is possible to reduce exposure by other means. 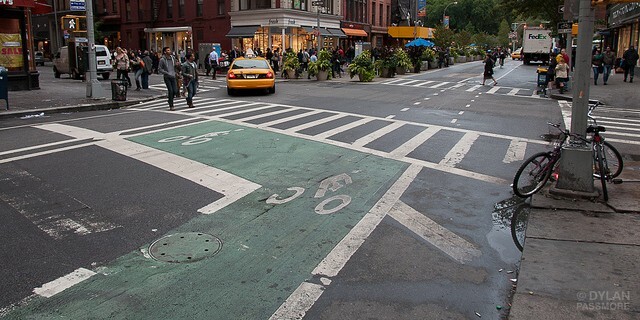 There are many good reasons to install bike boxes (waiting areas for people on bicycles to use during red lights) for standard bicycle lanes, and one is that they can help to reduce bicyclists’ pollution exposure at intersections by getting them out ahead of idling vehicles. Bicycle boulevards and greenways prioritize bicycle and pedestrian travel, leading to lower traffic volumes and lower pollutant levels. These routes are created through a combination of traffic-calming, signage, and other structures that discourage vehicle use or restrict certain vehicle turning movements onto the roadway. They also minimize required stops for people on foot and bicycle, which lessens the levels of pollutants (which are higher near intersections). Off-road trails or paths have been shown to have air pollution levels 1.5 to 2.3 times lower than on-street lanes, so that may be a good option when there is space available. However, it is important to take into account adjacent land uses; an off-road path that runs past an industrial area, for example, may create an even higher exposure environment. Not every city can (or is willing to) turn busy streets into bicycle boulevards or install separated lanes. At least one study suggested that targeted regulations on diesel vehicles serving downtown areas could mitigate bicyclists’ long-term exposure to particulate matter, but it’s clear that delivery and construction vehicles need to service a downtown core. At the very least, streets with non-separated bicycle facilities should not also be dedicated freight routes, and we should avoid placing non-separated bike lanes and bus routes on the same streets, when possible (as is already the practice in many places). But, since there are also good reasons for bus routes and bike routes to be close together, bike routes that are parallel but separate from transit corridors may be the best option. If we are installing bicycle facilities to encourage healthy behavior and environmentally-sound decision-making, we shouldn’t ignore evidence that certain types of bicycle facilities are better for our health than others. However, even if we move bicycles out of the way of the worst pollutant volumes, reducing the impacts of vehicle emissions on air quality is a nuanced and many-pronged process. I’m not arguing that exposure to pollution from traffic should be the only factor or the most important factor in planning for bicycle lanes and other facilities; I’m just arguing that it be given “factor” status and be brought into the equation so that it can influence the process when warranted by the conditions. For those of you wanting a more extensive overall primer on how different types of roadways and bicycle facilities can impact air pollution risks for people on bicycles, check out this webinar, which summarizes recent research (co-authored by Alex Bigazzi at Portland State University, who also provided some input for this post). I have learned a lot about what I’m breathing in, but I’ve continued to ride. I have not changed my commute route (for lack of comparable options to get across the Mall), and I haven’t taken the face mask plunge, but I have tried to ride more slowly when in mixed traffic, and I have tempered my proximity to tailpipes. I’m not sure if/when the National Park Service and DDOT will find a way to connect the Mall into the great bicycle infrastructure that is already in place in the DC area, but it’s clear that there are many ways (from both the planning side and individual bicyclist decision-making side) to reduce exposure and risk everywhere. Great piece, taking it from a different persective. One note on terminology: Although the FHWA uses “Separated Bike Lanes”, the more common term is “Protected Bike Lane” (assuming you ignore Chicago’s bastardization of the term by including buffered bike lanes). I appreciate this information. 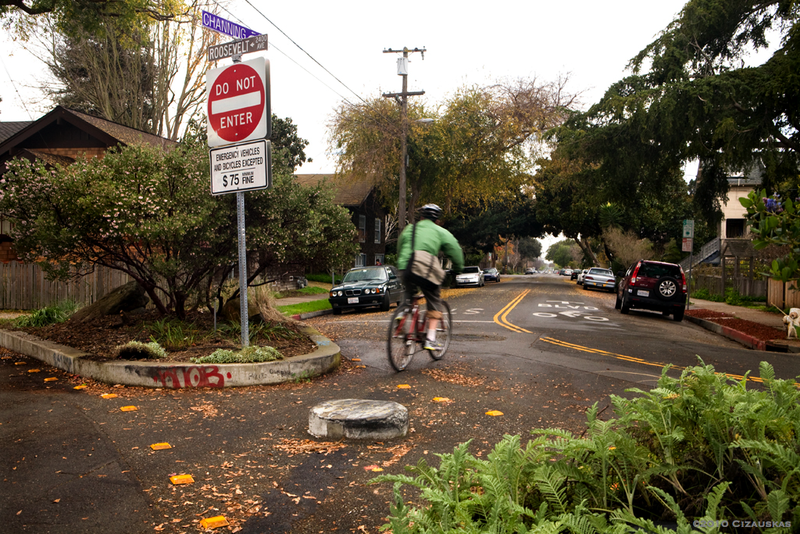 Offers more support for ideas like protected bike lanes and bike boxes. Now in addition to safety, we’re talking about respiratory health. As an European urban designer and mobility engineer [Barcelona UPC], our conceptual paradigm is based on the urban pacification aimed to have livable human cities and planning the mobility network as a hole. The first thing that needs to be done, is an appropriate master plan including every mode of transportation and taking into account their different needs and features [is a rider the same commuter as a driver? In fact, they are the opposite. In my speeches I always throw this question to the assistants: Why should I force cyclist ride through a noisy, polluted and dangerous avenue when I can design calm streets for their primary network or home zones for their connectors? After thinking deeply in this matters, the rest follows alone.